I hope you all had a sweet Valentine's Day. Now we get to throw a party because this Saturday Feb 18th is Mardi Gras, YAY!!!!! So remember, the one with the most beads WINS!!! And let's not forget that Monday Feb 20th is President's Day. I would also like to let you all know that I found out some very sad news this week, the Toyota Speedway at Irwindale has closed, so I know this will impact all of you racers out there who have been going to the Thursday night races. What a shock that was to me, I had not seen any news about this until Monday and I understand that Saturday was their last event. I was told that the L A Racing Experience would continue there though. So whether you are a first timer or have a little experience under your belt or maybe just a pure adrenaline junkie they have a racing Adventure Program that's right for you. They offer 10, 20, and 40 lap Adventure Programs as well as Competetive Courses for the more serious racer. For all the details on this program you can go to their website at www.laracingx.com. On Sunday Feb 19th the Bob's Big Boy in Norco is holding their monthly car show. This event is a lot of fun and I would like to recommend this show as a "fun for the whole family" event. We have a video on our facebook fan page from their show last month, and you can check it out, just search THE SPEED SHOP under "pages" on facebook. And be sure to have a famous Bob's Big Boy burger and shake while you're there. Please remember, if you have a show coming up you can email me at caeperformance@aol.com with all of the event info and I will include it in my weekly newsletters. And if you have printed flyers I would be happy to display them at our counter for our new customers. 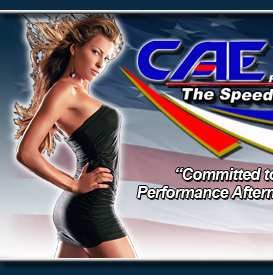 We also would like to help get the word out about local car clubs, and have a page on our website dedicated to the clubs and their events, you can view it at www.caeperformance.com under the CAR CLUBS tab. I would also like to take a moment and give a shout out to JERRY and RICK. I have, in recent newsletters, ask for some feedback and they have consistantly offered me their imput. So I'd just like to say THANK YOU!!!!!!!!!! So, I hope you all have a great Mardi Gras celebration and enjoy the long President's Day weekend.